MARK VOLMAN was cofounder of The Turtles, a 1960s pop-rock band that has sold more than forty million records. He was also a core member of Frank Zappa’s The Mothers of Invention and the dynamic duo Flo & Eddie. RUTH POINTER is one of the legendary Pointer Sisters who scored dozens of hits in the 1970s, 1980s, and 1990s, and sold close to forty million records, making them one of the most successful female groups of all time. BRIAN "HEAD" WELCH is the lead guitarist for the nu metal band Korn. In addition to chart-topping, million-selling records and two GRAMMY awards, their shows fill up arenas and stadiums worldwide. CHRIS HILLMAN helped define the country rock genre by his groundbreaking work with The Byrds, The Flying Burrito Brothers, Manassas, and the Desert Rose Band. JOHN ELEFANTE was the lead singer of the multi platinum-selling Kansas from 1981 to 1985 and wrote two of their highest charting singles. After leaving Kansas, he became one of the most successful Christian producers of all time. RUDY SARZO has been a professional recording artist for more than thirty years and a member of Ozzy Osbourne, Quiet Riot, Whitesnake, Blue Oyster Cult, Yngwie Malmsteen, and DIO. England Dan & JOHN FORD COLEY waved the soft-rock banner loudly in the 1970s, releasing several platinum and gold records in their decade-long partnership and Top 10 hits that are staples of classic rock radio today. With DEZ DICKERSON at his side from 1978 to 1983, Prince became a household name, selling more than one hundred million albums, earning seven Grammys, a Golden Globe, and an Academy Award. SHANE EVANS of Collective Soul dominated 1990s rock and alternative radio, charting an astounding seven number-one hits, nineteen Top 40 singles, and ten million in worldwide sales. NEDRA ROSS and The Ronettes were the first bad girls of rock and roll, racially indefinable, and one of the most exciting acts of their era, ruling the airwaves in the early ’60s with a string of girl-group classics and mini rock operas. RICHIE FURAY of Buffalo Springfield was a major catalyst for the 1960s country folk rock sound. Richie's repeat performance as cofounder of Poco carried on this tradition of great music. MARK FARNER of Grand Funk Railroad earned eleven consecutive RIAA Gold/Platinum Record Awards from 1969 to 1975. They surpassed The Beatles in record sales in 1970. JERRY NAYLOR is a sixty-year veteran of the music scene and the former lead singer of The Crickets. Naylor witnessed the birth of rock and roll with fellow innovators Elvis Presley, Jerry Lee Lewis, Roy Orbison, and Waylon Jennings—all changing the face of popular music. RICK CUA of The Outlaws helped create the Southern rock sound of the ’70s. In its heyday the band played major stadiums and arenas, reveling in the rock and roll lifestyle that included limos, charted planes, and the crazy fan scene. CHUCK GIRARD was a valuable pioneer in the California sound of the early 1960s and contemporary Christian music of the 1970s. In his teens, Girard formed The Castells, which had two Top 20 hits. A decade later he formed Love Song, the first mainstream Christian rock band. KEN HENSLEY of Uriah Heep is regarded as one of the seminal hard-rock acts of the early 1970s. Extremely popular in Europe, the Heep are considered by music historians as one of “The Big Four” of hard rock with sales of more than forty million albums worldwide. 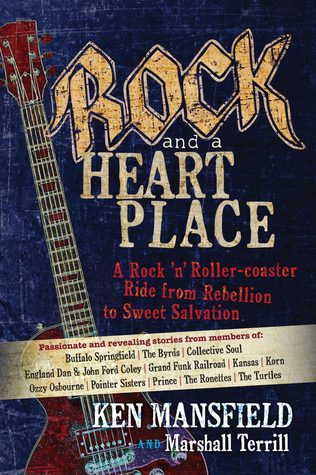 This not a book about how they got into music or rock and roll. It is showing how their lives went from being raised one way to leaving that path finding music and becoming successful, but then then finding themselves lost, alone, or just lacking some type of guidance in their life and were tired of being on the cycle of self-destruction. You have artists from the 60’s up to today’s hard rock. Even female artists one from the Pointer sisters which was a heart breaking for I remember listening to them but knowing all of the other things that they were going through. The lead guitarist from Korn Brian “Head” Welch, because he is from Bakersfield. His story really touched me because he had a little girl at the time and his ex was into the same stuff as him and he knew he needed help not only to save himself but to save his daughter as well. That was a very moving chapter for me. Not diminishing the other stories in the book just stating for my review. I don’t think it matters what generation you are from because once you know the song you will understand the person behind it, either by their band or by their name. this is a good book. I got this book from netgalley. I give this 4 stars.